Debate flares from time to time about just what the World Wide Web was really like in the mid-1990s, a pivotal time when Internet-awareness became a reality. Is it best thought of as the “Jurassic Web,” as a primitive and mostly empty cyberplace? Or ought we be more charitable and think of the early Web as a frontier of infinite and unfolding possibility? A hobbyist pursuit: Fair enough. 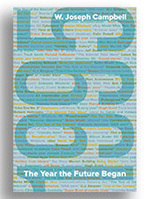 As I point out in my forthcoming book, 1995: The Year the Future Began, most Americans at that time had not gone online, although most people had at least heard about the Internet, and at least vaguely understood that it was a worldwide network of interconnected computers. It’s a telling line, one that I refer to in 1995. I also discuss how the Web’s novelty days are subject to clashing interpretations. Manjoo further wrote: “Sifting through old Web pages today is a bit like playing video games from the 1970s; the fun is in considering how awesome people thought they were, despite all that was missing,” by contemporary standards. “There’s no YouTube, Digg, Huffington Post, or Gawker. There’s no Google, Twitter, Facebook, or Wikipedia,” Manjoo wrote of the early Web. A somewhat more charitable characterization was offered a couple of years ago by Evgeny Morozov, in an essay in the New York Times. Morozov lamented the passing of cyberflânerie, the pleasure of wandering leisurely online without knowing where one would go or what one might find. It is, in any case, a mistake to look back and smirk at the undeveloped character of the online world in the mid-1990s, to chortle about the “Jurassic Web.” Doing so is to miss the dynamism — and the insistent “coolness” — of the early Web, and to blur understanding of the extraordinary distances we’ve covered online since 1995. This entry was posted on July 16, 2014 by W. Joseph Campbell in 1990s, Anniversaries, Internet, Watershed year, World Wide Web and tagged 1995, Cool, Early Web, Internet, The 1990s, Watershed year.